Chocolate ice creams: This food is low in sodium, manganese and selenium but Chocolate ice creams has total sugars in high quantity. Strawberry ice creams: Strawberry ice creams is low in total dietary fiber, total sugars and iron. Apple fruit butters: This food is low in protein, total lipid and ash but Apple fruit butters has total sugars in high quantity. Honey: High in carbohydrate and total sugars and low in protein, total lipid and ash. Jams and preserves: Jams and preserves is high carbohydrate and total sugars. On the other hand. is low in protein, total lipid and ash. Jellies: High in carbohydrate and total sugars and low in protein, total lipid and ash. Orange marmalade: This food has a low quantiti of protein, total lipid and ash but has a high quantity of carbohydrate and total sugars. Molasses: High in carbohydrate, total sugars and calcium and low in protein, total lipid and total dietary fiber. Canned apple pie fillings: In food has a low quantity of protein, total lipid and ash. Brown sugars: This food is low in water, protein and total lipid but Brown sugars has carbohydrate and total sugars in high quantity. Granulated sugars: This food has a low quantiti of water, protein and total lipid but has a high quantity of carbohydrate and total sugars. Powdered sugars: High in carbohydrate and total sugars and low in water, protein and total lipid. Maple sugars: High in carbohydrate, total sugars and zinc and low in water, protein and total lipid. Dark corn syrups: Dark corn syrups is high carbohydrate and total sugars. On the other hand. is low in protein, total lipid and ash. Light corn syrups: This food is low in protein, total lipid and ash but Light corn syrups has carbohydrate and total sugars in high quantity. High-fructose corn syrups: This food has a low quantiti of protein, total lipid and ash but has a high quantity of carbohydrate and total sugars. Malt syrups: High in carbohydrate, total sugars and niacin and low in total lipid, total dietary fiber and sodium. 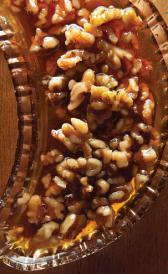 Maple syrups: Maple syrups is high carbohydrate, total sugars and manganese. On the other hand. is low in protein, total lipid and total dietary fiber. Sorghum syrups: This food has a low quantiti of protein, total lipid and total dietary fiber but has a high quantity of carbohydrate, total sugars and magnesium. Pineapple toppings: This food is low in protein, total lipid and ash but Pineapple toppings has carbohydrate and total sugars in high quantity. Nuts in syrup toppings: This food has a low quantiti of sodium, selenium and vitamin c but has a high quantity of food energy, total lipid and carbohydrate. 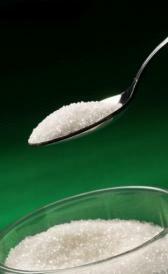 Turbinado sugar: High in carbohydrate and total sugars and low in water, protein and total lipid. Grenadine syrups: High in carbohydrate and total sugars and low in protein, total lipid and total dietary fiber. Liquid pectin: In this food there are some nutrients that are found in low quantity, for example food energy, protein and total lipid. Chocolate frozen yogurts: In this food there are some nutrients that are found in low quantity, for example iron, sodium and zinc. Dietetic syrups: In this food there are some nutrients that are found in low quantity, for example food energy, protein and total lipid. Sugarless chewing gum: High in carbohydrate and low in water, protein and total lipid. 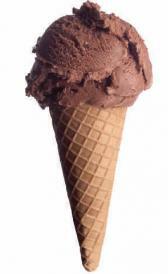 Rich chocolate ice creams: Rich chocolate ice creams is high saturated fatty acid. On the other hand. is low in total dietary fiber, sodium and selenium.